What can I say? Star Wars is a classic. January 31 was my birthday. I have never had a better birthday gift than being able to see this movie. The experience was just amazing. Our tickets had to be bought a day in advance. We had to get there an hour early just to get a good spot in line so we could get a good seat. Every showing Friday night was sold out. People could not wait to see this movie and experience the digitization, added special effects, and surprises that it contains. Just feeling the energy of the crowd was enjoyable in itself. After a couple of trailers (previews), one guy stood up and shouted his own version of the now famous Jerry Maquire quote by yelling, "Show me the movie!" Then came the trailers for The Empire Strikes Back and The Return of the Jedi. By then, everyone was clapping and cheering their way into history. The movie was great. We all loved it. We all had a chance to see our favorite scenes and characters on the big screen. Different scenes brought different cheers. This was my first time to see it on the big screen as I was only 1 year old when it first came out. And its not like any of us had trouble understanding the story or keeping track of the many characters. We were there to relive the excitement. I grew up with STAR WARS. This movie has had a significant impact on who I am today. I was able to catch some of that unbridled, heart-pounding exuberance that I had in my youth. I was at peace with myself and all of creation while I was watching this movie which, I admit, is ironic since the movie is titled, Star Wars. When the movie finally came to a close (and what movie, by the way, has a better ending than the awards ceremony at the end of Star Wars?) everyone was applauding a classic, and thanking George Lucas for giving them this chance to see it again, for the first time. This praise is, of course, why Lucas did this. That and the billions of dollars that this re-release will ultimately earn him. 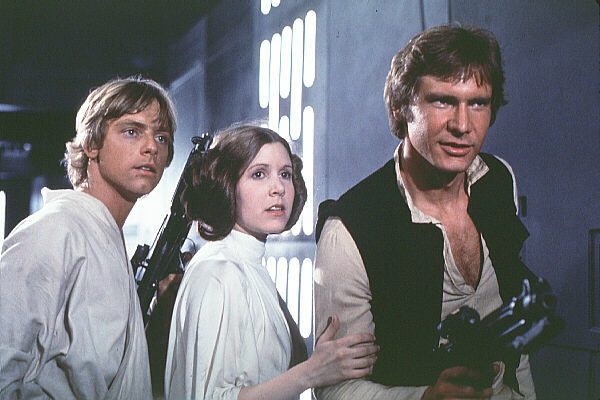 How would you rate the movie STAR WARS: Special Edition? There have been 55424 people to visit this page since Fri, Jan 31, 1997. And you are the first person to visit this page today!